Both teams started with very solid reclears, 1-shotting bosses that made us struggle and squirm last week. Nothing to cover here – we simply refined strategy and honed in on what works and what doesn’t. Black had 1 extra pull on Conclave due to tank damage using battle-res’s. Surprisingly, both teams had to have additional pulls on Mekkatorque. We have people who are not moving the raid-wide damage close enough to the wall, and others who are not helping themselves with the robot mechanics. We wanted only those inside robots to be calling out colors (as that’s what’s going to happen in Heroic), but people either couldn’t find another robot, or they completely forgot. We only had 1-2 times that was successful in each group. We’re asking that people start by using https://wago.io/wT9PCFmVW to help callouts. Hopefully as time goes on there will be other auras that will help callouts. In the meantime, if you do not have a microphone when we get to Heroic Mekkatorque, you either: a) need to get one b) need to be fast with typing c) need to sit. Both teams reached Stormwall Blockade with only a few pulls left in them. Black had more practice on the pier, and thus downed the boss in 3 pulls. We wound up completely ignoring adds eventually and just burning the boss down while the timer ticked (if anyone remembers our first MOTHER kill, it was a lot like that). Red reached the pier every time, but only had enough time for 2 pulls. Much like Black’s previous week, Red had a practice day on Sunday to work on the mechanics of the stormwall fight. 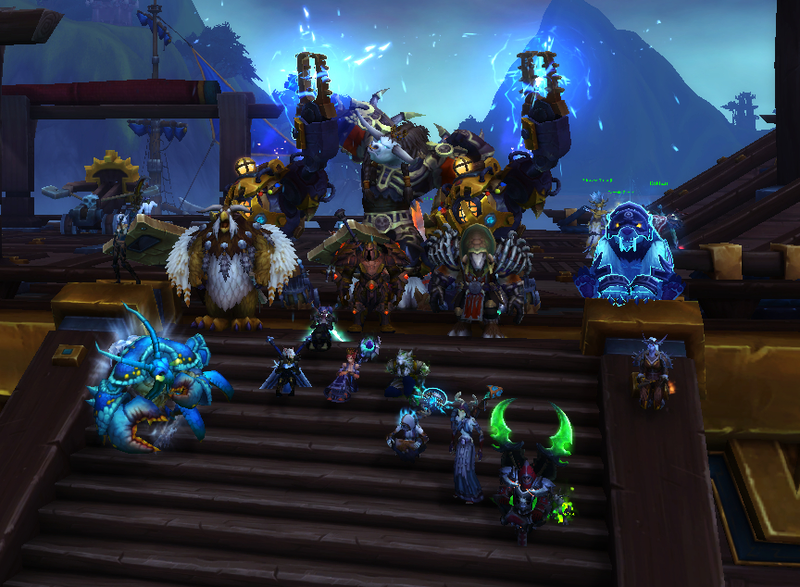 It was a relaxed atmosphere and we spent a good amount of time discussing what worked, what didn’t, what each buff/debuff did, and expectations of individuals within the fight re: soaking, slows, etc. We were missing some key players (all of our hunters, for example) but had some very solid pulls. We also had a new strategy of having a side-soak group to pick up any Ires on the far side of the dock. Black Team spent the night progressing on Jaina. We were missing a few key players here, but we worked around their absence. We learned before the start of the fight that the adds in the boat phase can be Mind Controlled and walked off the boat, so we had our priests hop to. This left the DPS with more damage on the boss. We organized specific ranged DPS to have specific cannons to fire (for example, I was always the front-right cannon). When we got to the second phase with barrels, we marked specific barrels and moved clockwise from barrel to barrel. 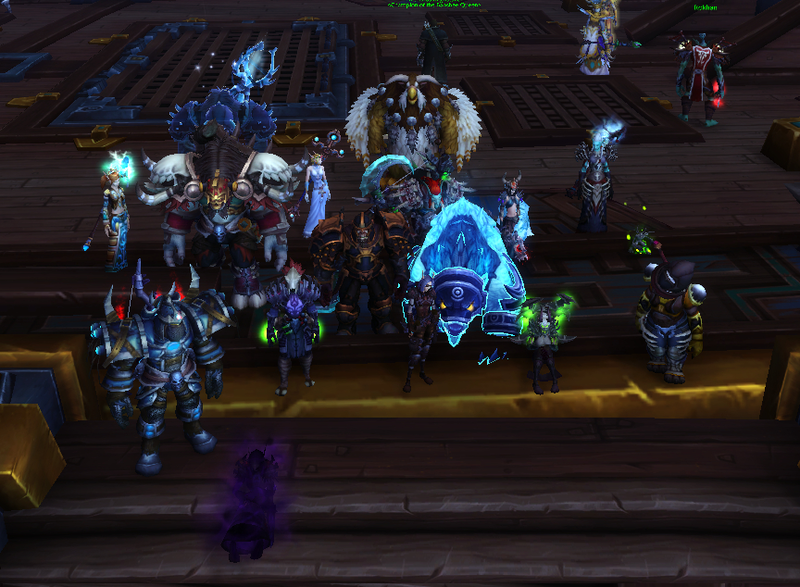 We also assigned specific people to get to Jaina first and interrupt her, while the rest of us sat back and just dodged mechanics (speedy rogues and shamans worked well here). We opted to lust when we got the first or second mirror image add, depending on who was up and how we were progressing. RLs made some mistakes with jaina’s health percentage (she needs to get to 30% and we kept thinking 40%) but recovered well. In order to down her, we had to comp down significantly – we simply had too many bodies on the field, causing a number of problems that wouldn’t arise otherwise. We went with 3 healers and 8 DPS, which dropped Jaina’s health a significant amount. 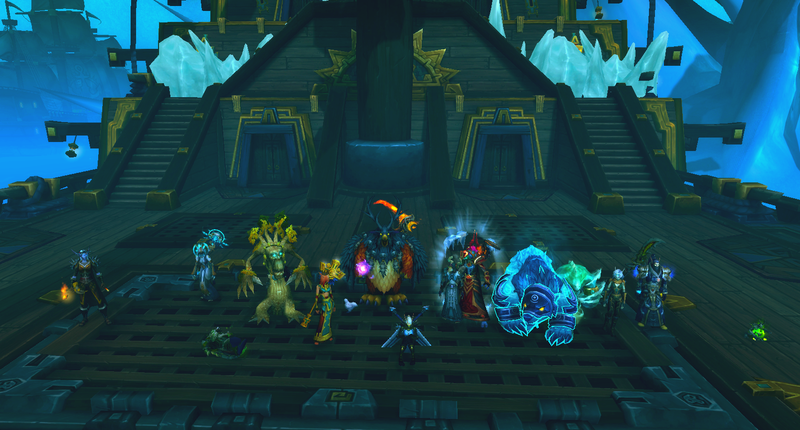 Our kill was our cleanest pull – only lost 2 people right at the end, and had incredibly few people be frozen solid. Red Team spent most of their night progressing on Blockade. We were missing some key players again, so we had to make due with some fills. There were a number of really well-done pulls on the pier. Cleaning up the sea swells is becoming easier as people group and re-orient themselves back to where they need to be more often. More people are remembering to use CC to slow the adds. All in all it came down to a question of when to lust, and when to hold off. We wound up with a cleaner Blockade kill than black team because of persistence and practice. Because we downed Blockade with time to spare, we also wound up getting to look at Jaina. We again assigned ranged DPS to specific cannons, and had groups rotate around the room barrels to clear stacks. Our reaching Jaina went about as expected- too many people got frozen. We need to find some specific people who can reach her fast. However, we reached her phases pretty quickly, so I suspect it won’t take long to get a kill on her. Both teams will begin progressing Heroic this week. If anyone who missed a Jaina kill from Black, or those from Red want to give her a shot, we will consider doing that on the second night (or when we hit a wall on heroic, whichever comes first). But it hasn’t yet been decided. Feel free to PUG normal regardless. 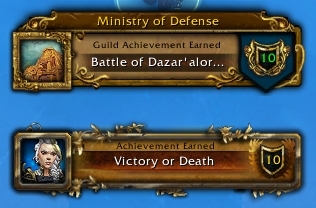 We’re heroic progressing full-time now! Because Heroic is more tough than normal (duh) we’re going to start being less lax about benching people for repeated mechanic failure. If you mess up because you’ve never seen a mechanic before, that’s fine! Don’t worry. Nobody expect perfection. But if you mess up after seeing the mechanic a 5th time…well…that’s a problem. Raid-wipe mechanics are more prevalent in Heroic and if the same people are causing them we’ll sit you temporarily until something can be figured out to help you improve. No-call no-shows are starting to hurt the groups. If you cannot attend regularly, please consider bowing out and moving to our backup roster. There are going to be people that we are going to start doing that to this week because we are simply not receiving communications from them. If you know that you will be absent, let us know ahead of time so we can plan for it. We will never penalize someone for known absences, or if something extraneous comes up (illness etc). Stop taking breaks at unassigned times. We’re losing valuable time to people getting up to pee, getting drinks, etc during non-break times. Some nights it seems like every pull that someone has to leave “for just a minute” (could be upwards of five). Pee during trash, get drinks when you’re dead (and unlikely to be resed). The more this happens the more likely you will find yourself losing your spot. We understand, again, if something extraneous happens (internet goes out, kid fell), but we’re noticing a trend that’s causing us to take too much time between pulls. At the moment, both teams are lacking reliable attendees of some classes or specs. We’re going to start looking into recruiting reliable people to come to raids and benching the no-call no-shows. This will be a bit of a transition. If you know hard-hitting, mechanically-oriented players who would do well on either team, have them reach out to us. We’re not looking for all specs, but we’ll take names down anyway. I’ll start by saying that your complaints aren’t falling on deaf ears and your voices aren’t unheard…provided we get a chance to hear them. If all you do is complain in private or make snippy comments in discord text channels, we won’t be able to properly address your concerns (many of which are likely valid). If you’re afraid to reach out to a Warlord, you are always welcome to reach out to Urostek. He’s a pretty chill bro. Moving to two teams has been rough. It’s been stressful for you and it’s been stressful for the raid leads. I haven’t had a night off in over 2 weeks, between raiding 5 nights a week (including pickups) and bowling for 2 nights a week. 6 hours per group + pickups = 15 hours a week raiding. And that is not even counting the pre-planning, review, followups, and more than the raid leads do for each group, separately. That’s a lot of hours – basically a part-time job. Chances are I’ve been unduly unkind as a result, and I know the other raid leads have snapped as well. We apologize if we’ve been rude to anyone. We’re trying to make this work the best we can, but we’re only human. That said we’ve all taken some time to step back and breathe and be less intense about our feedback mid-raid. Hopefully it smooths out over time. At the moment we’re somewhat resistant to change because we want everyone to give this time to work, and we want people to be patient as we work through the kinks. If it seems like we’re being stubborn, it’s because we want you to give us a little slack right now. We’re doing this for fun, and for you guys to have fun. That said, we’re open to suggestions and are happy to work with you on what you think we can do to improve. Resulting from discussions, we’ve halted the search for an extra healer for Black team; we added a pickup day for Blockade for red; we posted a poll about the Saturday times (a time that is inconvenient for the Warlords won and we stuck with it); we’ve spoken to people comparing the teams unfavorably or too competitively; we’re bringing back alt nights (soonTM). We’re getting a lot of negative, hurtful comments about our character as a result of how we’ve chosen to run things. It really stings to be called names when I and the other Warlords doubled up our time and energy to provide a fun environment for the largest group of people we could. If you have any feedback on the way things are run or how things are going, please take a breath and try to come up with a viable solution before reaching out to us. If you can’t come up with one, at least be patient when you talk to us, because we may not have a way to address your concern immediately, either. But I can promise we’ll try. We know that not everyone is happy we moved to two teams. Unfortunately the alternative was to bench 30+ people, including some of our longtime friends. We’re not changing this decision. Everything else is open for discussion.